AVerMedia, a global leader in the frame capture market and manufacturer of digital multimedia video convergence technology, has showcased the AVerCaster Lite SE510 Portable Live Streaming Solution for HDMI and CVBS Sources. With the rise and popularity of video-sharing websites such as YouTube, UStream, Twitch, Akamai and CDN Video, the demand for video streaming has continued to rise sharply. At the forefront of video capturing technology is the AVerCaster Lite SE510 , specifically designed to meet the rise for video capturing and live streaming. Video encoding and streaming is now just as easy to obtain as it is connecting an HDMI or analog device. With cutting-edge video processing and streaming technology, built-in WiFi and a support for mobile management, the AVerCaster Lite SE510 is the single device to ensure trouble-free operation for video-sharing requirements. As expected, the AVerCaster Lite SE510 has a robust design with features such as: Graceful Recovery for periods of network and video signal loss, simplified practical setup and operations, flexible Internet connectivity and mobile management. The AVerCaster Lite SE510 delivers a simple, one click streaming function making it easy for flawless operation. No key-in, configuration or additional settings required. One-click live streaming gives the option to provide viewers unhindered streaming choices. Live streaming is impractical when clients are stranded from accessing a wired Internet connection. Both wireless and wired access is supported on the SE510 enabling effective operations for use anywhere. The AVerCaster Lite SE510 can be connected to any access point with its Ethernet port or to a wireless network through 2.4 GHz / 5 GHz WiFi. 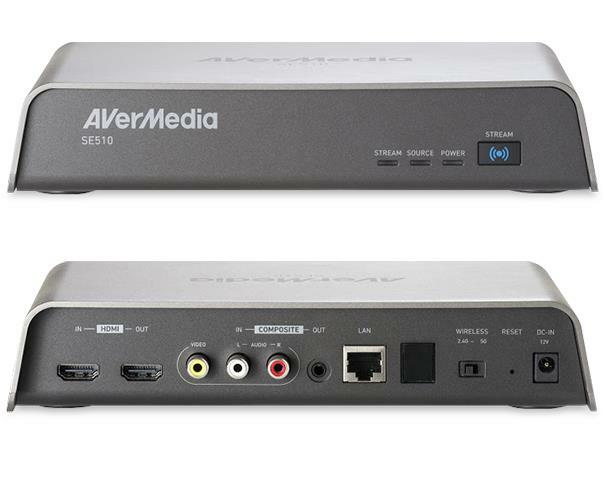 AVerMedia’s NexStream application lets users detect and manage SE510 devices on the network. With added support for Windows, iOS, and Android based devices and computers, AVerMedia’s NexStream APP gives broadcasters access to the SE510 settings and enables administration directly through mobile devices; creating greater ease for operations and mobile management. By incorporating technology that keeps broadcasters connected to the Internet and provides simplified streaming and capturing functions, the AVerCaster Lite SE510 becomes the versatile solution for Live Streaming and digital solutions providers. By adding the ability for mobile operations and management, AVerCaster Lite SE510 gives you the freedom to go live anywhere. AVerMedia’s AVerCaster Lite SE510 simply is the only logical solution for your next video live streaming endeavor.